Paid Search + Programmatic: Structure. Optimize. Produce. A well structured, intelligently targeted, and continually optimized paid search account is the cornerstone of a successful search marketing campaign. Partnered with advanced programmatic bidding technology, our strategy goes beyond basic campaign optimization to utilize machine learning to achieve maximum budget and revenue efficiency. GCommerce’s goals were to achieve an optimal return on advertising dollars spent while maintaining the promise to give every single hotel location representation through paid search traffic. These goals guided our approach to PPC campaign structure, budget allocation, and ongoing paid search optimization. GCommerce knew the unique structure and budget at Vantage would benefit from the smart implementation of programmatic, so we set out with the Vantage team to evaluate options. We knew that with the right programmatic bidding platform, we could achieve more efficiency out of their budget. 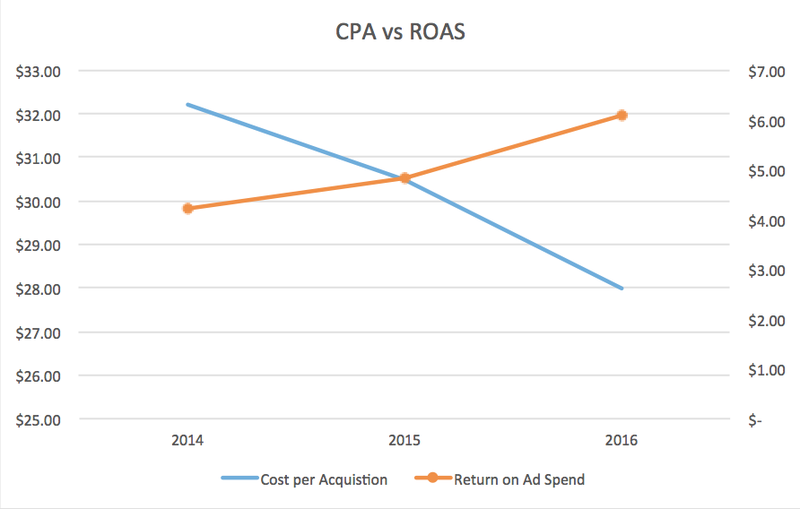 Since 2014, GCommerce was able to increase return on ad spend by 44% and decrease cost per acquisition for hotel PPC campaigns by 13%. This focused on utilization of a novel paid search campaign structure for hotels, designed to enhance efficiencies of the programmatic bid optimization platform. We eliminated phrase match keywords – After analyzing historical performance of our hotel PPC campaigns, we found phrase match to capture fewer impressions, drive fewer clicks and less revenue. It also consumed a higher cost-per-click. We found that broad match modified paid search keywords allowed us to match with the same search queries that phrase match keywords would have captured with a lower cost-per-click. We continually optimized the hotels’ PPC campaigns through tactics such as negative & positive keyword research, removal of keywords with high spend yet no conversions or assisted conversions (utilizing automated rules in Adwords) and ad copy testing. Finally, we utilized programmatic bidding technology for the hotel PPC campaigns to achieve efficiencies in budget allocation and cost per click while working towards the goal of maximizing revenue production for the hotels. The algorithm’s ability to make 100’s of real-time bid adjustments daily based on historical conversion performance of keywords, took our bid optimization beyond the limitations of manual or rule based adjustments. GCommerce utilized a combination of advanced paid search structure, optimization, and technology to grow campaign performance to help Vantage increase revenue production and return on ad spend while lowering cost per acquisition. Never stay complacent in your approach to paid search for your hotels. Test new paid search structures, continually optimize and take advantage of available technology to improve efficiencies and you’ll achieve success.